THE FOREIGN SUPPORTERS CLUB OF MÁLAGA CF! In late 1999, it was noticed that there was a great demand for a more international supporters club of Málaga CF. Thus was the beginning of 'Peña Internacional Malaguista', created in Marbella. It is the first international supporters club on mainland Spain, and was made official in March 2002 as a recognised Peña of Málaga CF. Since then, 'Peña Internacional Malaguista', has provided a service to men, women and children from all four corners of the world who have taken Málaga CF into their hearts. 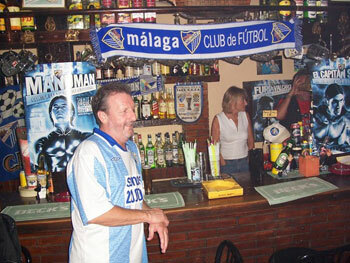 Closer to the home of the club on the Costa del Sol, 'Peña Internacional Malaguista' is based at The Tavern Pub in Old Town Marbella. On this website you will be able to follow the progress of Málaga CF. You can also swap opinions with other supporters, no matter where you are in the world. You can join the Peña here. 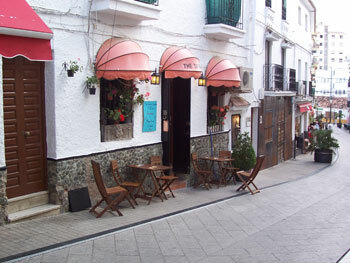 Pics: The Tavern Pub, calle Peral, Old Town Marbella, run by Peña President Ken, and Pam.